Launch Sequence. Beautiful Shots. Narrative follows. A bit windy for a launch but what the heck. 5 new photo voltaics (PVs) added. Their newly connected lines shown uncovered on the roof as she is lowered. Oh God, thy sea is so great, my boat so small. Coming into the fairway on her way back to slip number 18. The twin electric motors make her guidance a single handed delight. Back in her slip and the final preparations to leave again for the Great Loop with her new additions. 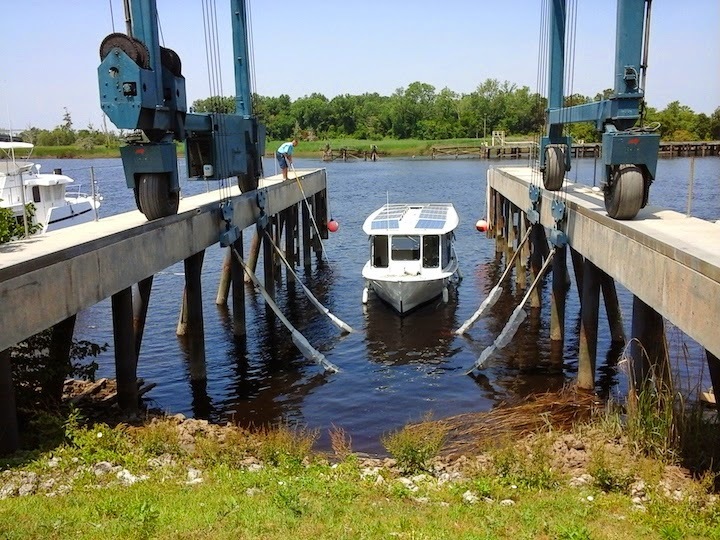 The boat was on the hard, scheduled for a launch between May 20th and the 26th. However the boat yard was filling fast with very large boats requiring long rework periods. Not wanting to be boxed in by other boats for another month or two, the decision to launch was made for Wednesday the 21st of May. 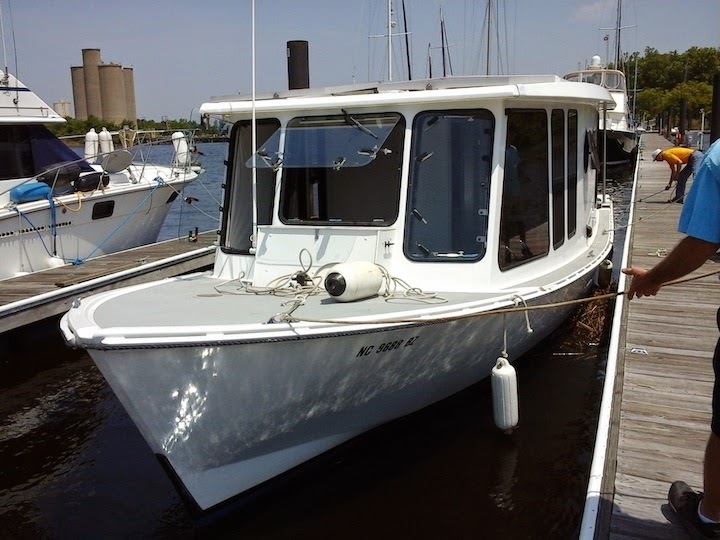 Feverishly the lower hull was completely polished, motors re-rigged, steering set up, batteries watered, solar modules redirected to the remaining PV controller, fenders secured, deck lines re-placed, interior (a mess) cleaned and stowed. 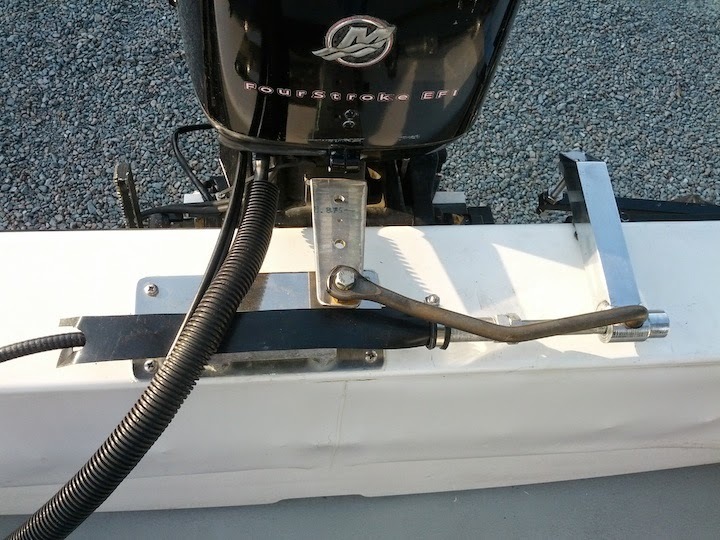 Also the yard folks had to paint where the jack stands had been used to help support the boat as well as touching up a few spots of bottom paint. 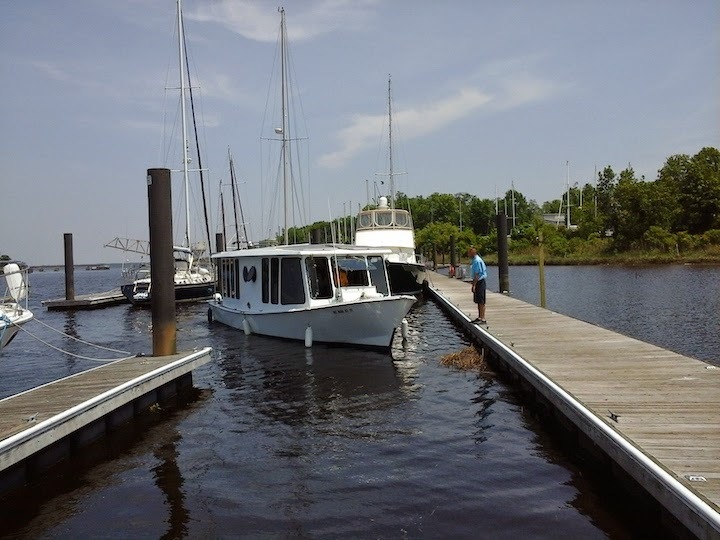 With that flurry of activity completed, the next order of business was to put her in the Cape Fear River. Darn if the wind wasn’t blowing forcefully and the tide in a run. 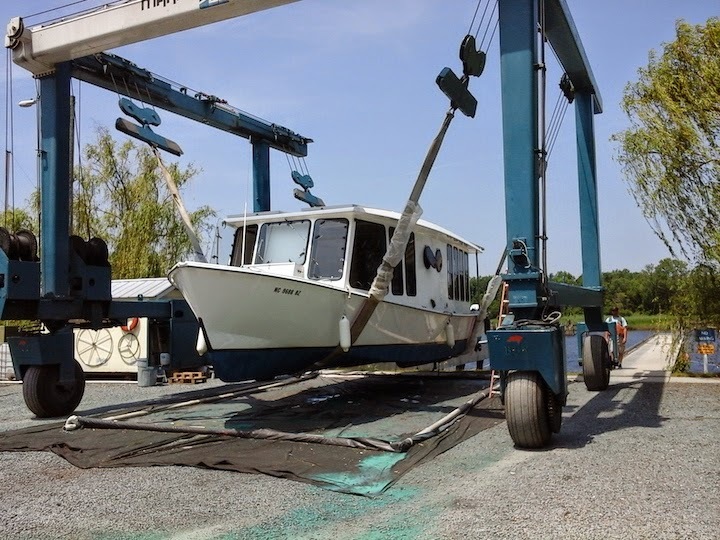 The trouble was she had to go in quickly because another boat needed to be put on the hard, in the yard, ASAP. These days the litigious society in which I live does not permit the owner to ride in the boat as the Travel Lift machine launches the boat. No, that would be too simple. Now the boat is moved with no one aboard and then one must scramble down a ladder nearly twenty feet to the side deck of their boat. This is not the yard’s idea, this is the result of nanny-state lawyers messing with boats to protect the insurance companies from lawsuit happy people. Oh well, that is my rant for the week. Once in the liquid all things settled down to a fine hum. 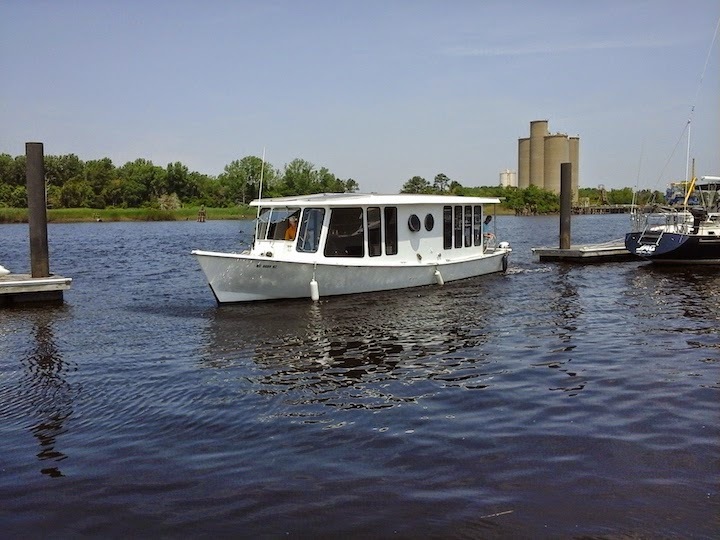 The auxiliary gasoline engine was tested while backing out of the Travel Lift sling, then down river a bit to the fairway for the entry to the slip. The gear shift was tight, not having been used for a while but loosened up quickly after some shifting practice. The new steering was so very nice, moving all the motors and engine in a coordinated manner that made negotiating the turning and backing seamless. The switch was then made to the twin electric motors to enter the fairway (the lobby of the slip area). Seamless again, the boat was partnered with the direction of wind and tide to allow a highly controlled entry to the main dock and a cake walk into the slip. Lines tied to the dock cleats, a feeling of accomplishment coursed through me. A lot had been required to upgrade the ALGEMAC II from last year’s four day Great Loop test and adventure. Now a new adventure to continue the MOG’s Great Loop looms ahead. 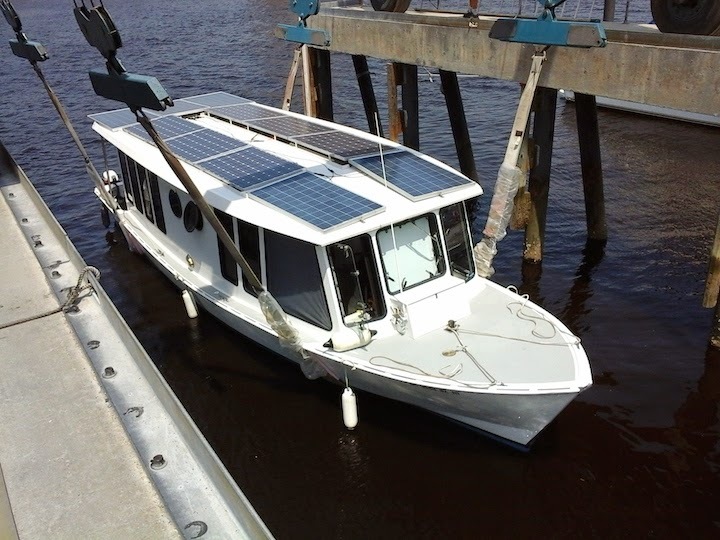 Our first boat test will be right after installing the new PV controller, weather permitting, by the first of June. Being late to start anything is not new to me. Time has taught me well, that patience is requisite for the project at hand. I am enjoying (to the extent I can) every moment. The timeline is not a schedule. It is, the time of my life. Additional clamps to hold down the newly added 5 PVs. Newly added is a steering control for all or any combination of electric motors and auxiliary engine. 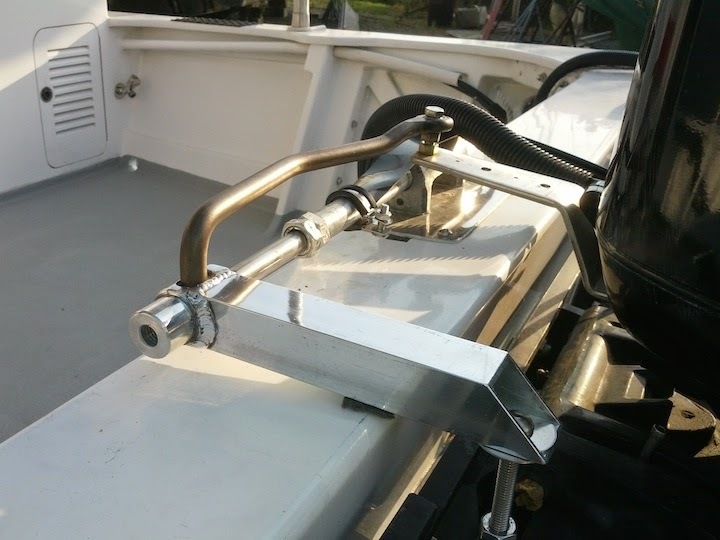 A view over the stern of the arrangement for the steering ram and the drag bar linkage to the electric motors. Burn marks on components after I shot 166 VDC into the Trace 40 controller, meant for a max of 125 VDC. My bad. Blackened component (was all yellow) and two half burnt blue round knobs (now half black and blue) and the blowndisc next to yellow component. The final push to get the MOG Canal Boat “ALGEMAC II” back into the water has been a blur. 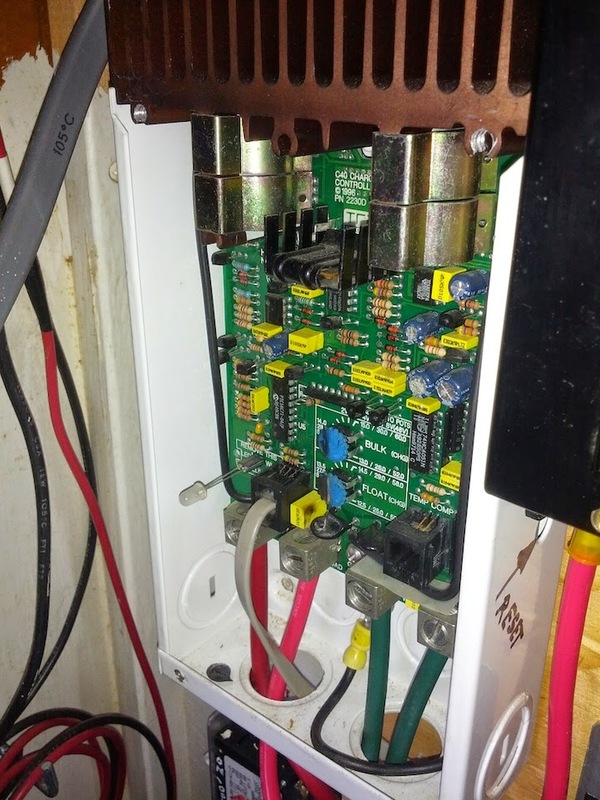 To be a bit economical, I had considered using the old Trace C 40 photovoltaic (PV) controller. 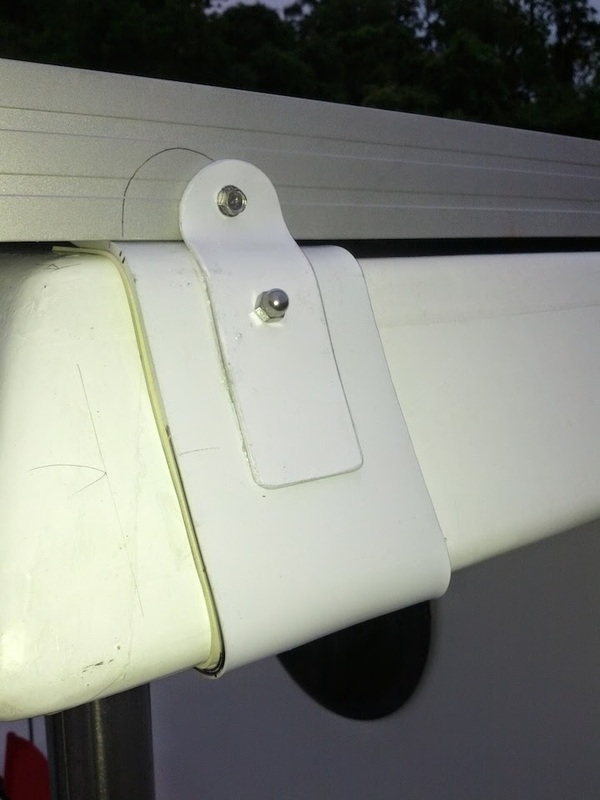 It was to be used for the second set of 5 PVs newly placed atop the boat (as described in the last blog entry). Instead I decided to use the old controller for a test. Knowing that there is usually a bit of leeway in the electrical specifications for the PV controller and that the amount of electricity (voltage and current) usually does not exceed the maximum stated values in the PV specifications….The test was made to place the PVs in series, hook up the PV controller and see if the peak voltage is above 125 volts DC. It measured above but that was what is called the open circuit voltage. Long story short, I did cause a voltage spike, not caught by the circuit breaker and knocked the old Trace 40 controller out of commission. The new five photovoltaic modules are now in parallel instead of series with the offending (too slow) circuit breaker put out to pasture. I have been convinced that the specs, these days, are there for a good reason and should be read well and noted. Chiding aside, it was interesting to see, as I would not have continued to use the old controller, even though Trace (now Xantrax) makes a superb and long lasting unit. Newer is better, at least from a warrantee standpoint. Thank you again for your interest. The MOG is developing innovations continually. hi. thank you for sharing this one. upon reading your blogs, I read more about Electric Motors , that helps me a lot. because im currently looking about electric motors and the uses of it.